An important role for CW3E is to provide opportunities and an environment where students, PostDocs, early career scientists, and engineers have a chance to grow professionally and then naturally move on in their careers. While we have been growing as a Center and developing a team of dedicated long-term staff, our vision includes the fact that for some people their time here is inherently temporary, and for others, personal or family factors may pull them in new directions. This note is to share, and to celebrate, the recent moves of four people into new positions in both academia and the private sector. Also, I would like to personally thank each for spending some of their time and energy in ways that have helped CW3E grow, and to develop a culture of collegiality, respect for diversity of people and thinking, and of partnership and collaboration. Best wishes in their new endeavors! Dr. Aneesh Subramanian started this month as an Assistant Professor at University of Colorado, Boulder. Aneesh will be developing a group to continue his research to improve prediction of extreme weather events along the U.S. West Coast at all time scales. In addition, he will begin teaching classes this semester. 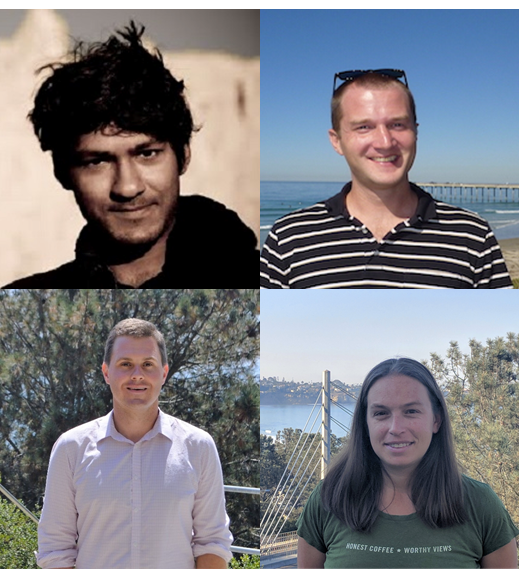 CW3E looks forward to collaborating with Aneesh on research to enhance subseasonal to seasonal forecasts, data assimilation, and ocean-atmosphere coupling. Dr. Andrew Martin started this month as a research assistant professor at Portland State University (PSU). Andy will focus on research in hydrometeorology and climatology, emphasizing the Pacific Northwest. Topics will include many that he first developed as interests at CW3E, including atmospheric rivers, mesoscale frontal waves, rain-snow levels in climate data and forecasts, clouds and aerosols, and mountain hydrology during extreme events. Andy will also bring to PSU experience in stakeholder decision support and community partner engagement. Early directions include collaboration with the City of Portland on hillslope erosion research and membership on the executive committee of the Northwest Climate Conference, to be held in Portland in October 2019. Andy will continue to be a critical member of the West-WRF team at CW3E on both the operations and research sides to enhance improvements in the West-WRF model. Dr. Brian Henn, after two years as a Post-Doctoral Scholar at CW3E, became a Data Science Fellow at Insight Data Science in Seattle, Washington. This competitive program provides intensive training for scientists on the latest developments in machine learning and data science in industry. After completing the fellowship, Brian is now the lead data scientist at FlyHomes – a tech-enabled real estate startup in Seattle – working on forecasting and machine learning products. He continues collaborating with CW3E on snow level forecast evaluations, including contributing to key publications. Dr. Leah Campbell, after about a year as a Postdoctoral Scholar at CW3E, began a position this month at RedCastle Resources Inc., a natural resources consulting company in Utah. Leah is a remote sensing data analyst and programmer working on projects related to ecosystem and forest change monitoring.